Objects, Functions, and What the Heck are Vectors anyways? to create subsets of the data for when the husband makes more than the wife and for the reverse. 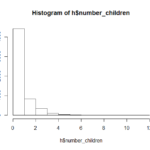 I then used the mean function to determine the mean number of children for each case. I tried to quickly graph the difference in the two, but quickly realized that it would be significantly more involved than simply using the plot function, but I was able to make histograms to compare the two. 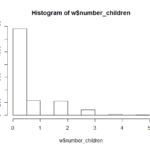 The formatting for w$number_children is weird for some reason. I don’t see why there should be empty gaps between the x values, but I’ll chalk that up to the simplicity of the hist function for now. Edit: It looks like the underscore in the URL doesn’t display properly. I’ll try to look into it later because I’m sure it’ll be a recurring issue. 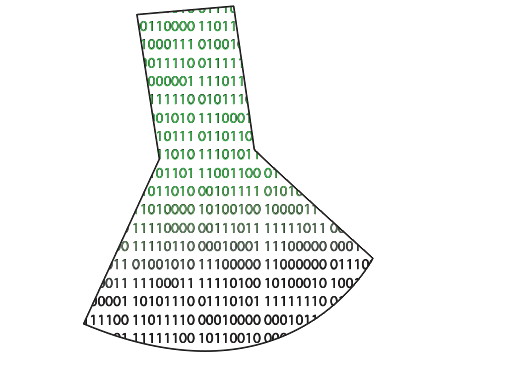 Also, I think I just got vectors working in my head. I had my acs table sorted with decreasing household values.